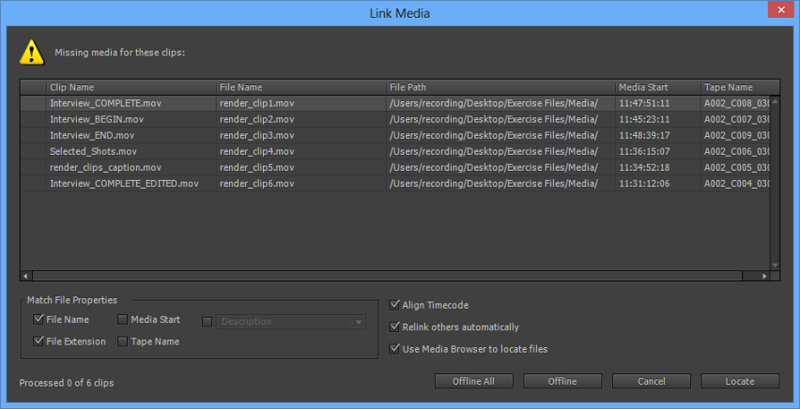 Premiere Pro helps you locate and relink offline media by using the Link Media and Locate File dialog boxes. When you open a project containing offline media, the Link Media workflow lets you locate and relink the offline media, bringing them back online for use in your project. For more information on offline files, see Working with offline clips. When you open a project with missing media files, the Link Media dialog box gives you visibility into files that have broken links and helps you locate and link your files quickly. The Link Media dialog box displays the clip name used in the project, as well as the linked filename of the media. The Link Media dialog box also displays the complete path of folders that stored the offline media. For example, when you import a clip into a project for the first time, the clip uses the media filename by default. 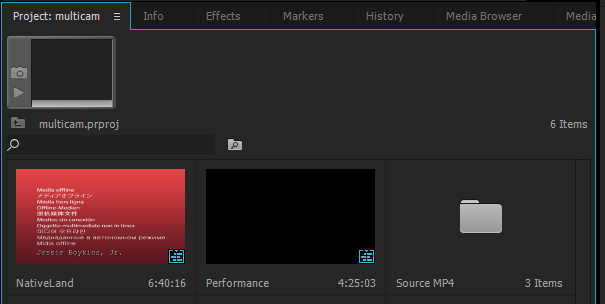 Later, even if you rename the clip, Premiere Pro can help you locate the clip even if the media file is offline. Depending on how you want to handle the offline files, you can specify the required search criteria and Match File properties. To help effectively locate missing media, you can select properties like File Name, File Extension, Media Start, and Tape Name. You can also select metadata properties like Description, Scene, Shot, and Log Note. When you click Locate, the Locate File dialog box displays matches depending on the selected Match File Properties. Therefore, to match and link media, you need to select at least one property under Match File Properties. The combination of Match File Properties that you select should uniquely identify each media file from the set of files being relinked. Premiere Pro automatically finds and links offline media where possible. In the Link Media dialog box, the Relink Others Automatically option is selected by default. 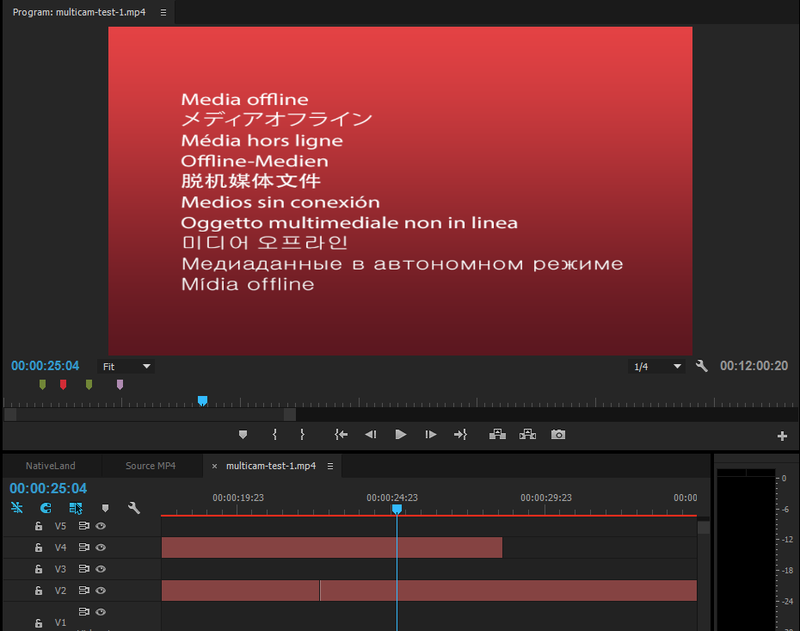 Premiere Pro tries to relink the offline media with as little user-input as possible. If Premiere Pro can automatically relink all missing files when opening the project, you do not see the Link Media dialog box. The Align Timecode option is also checked by default to align the media file's source timecode to the clip being linked. Select some files and click Offline. Only the selected files are made offline. Click Offline All. All the files excluding the files that have already been located are made offline. Click Cancel. All the files listed in the Link Media dialog are made offline. Select the offline clip in the Timeline, and select Clip > Link Media. Right-click or Ctrl-click the clip in the Timeline, and select Link Media from the context menu. You can manually find and reconnect the media that Premiere Pro is unable to automatically relink. To do so, in the Link Media dialog box, click the Locate button. The Locate File dialog opens with the closest existing directory showing up to three levels. If no exact match is found, the directory is displayed considering where the file should have been, or the same directory location as the previous session. The Locate File dialog displays the file directory listing using the Media Browser user interface by default. If you want to locate the files using your computer's file browser, deselect Use Media Browser To Locate Files in the Link Media dialog box. You can manually search for a file within the Locate File dialog by clicking Search. Looking at the Last Path can help you locate the exact missing file easily and quickly. You can edit the Path field. If necessary, you can copy the full path or a segment of the path from the Last Path string, and paste it into the Path field. This option is especially useful to quickly help locate the path to the missing file. To help you narrow down your search results, the Locate File dialog also provides you with advanced filter options, like displaying specific file types and selecting Display Only Exact name Matches. In addition, you can switch from a list view to a thumbnail view for a visual confirmation of a specific media file. 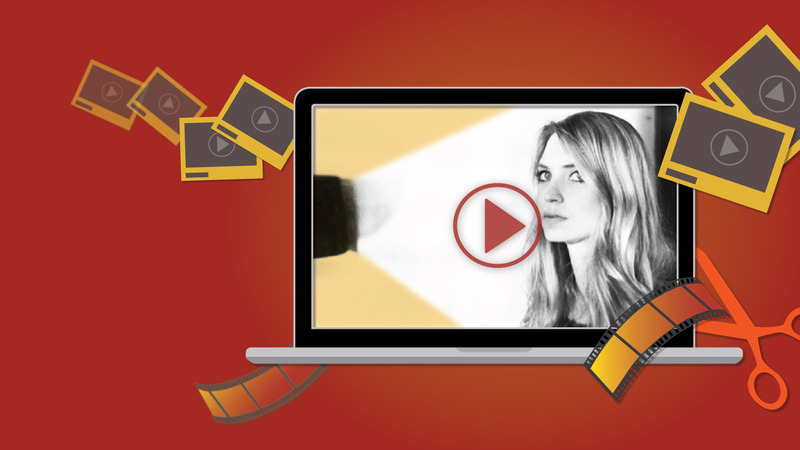 Follow this project-based tutorial to learn how to get your video, audio, images, and other assets into Premiere Pro. Learn how you can easily find them again if they move or get renamed.